Flavour bomb explosion! 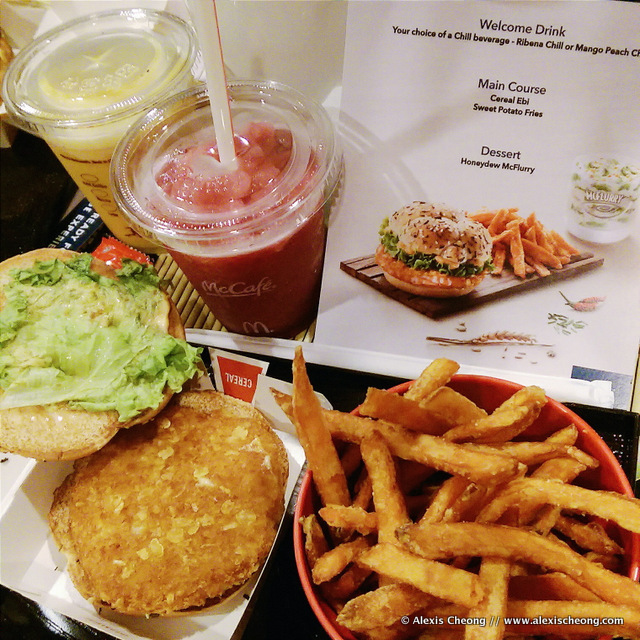 I was invited to try out the new Ebi Burger from McDonald's on Monday, and was intrigued because I was told that it is different from the regular Ebi burger, but wasn't told what exactly was different. 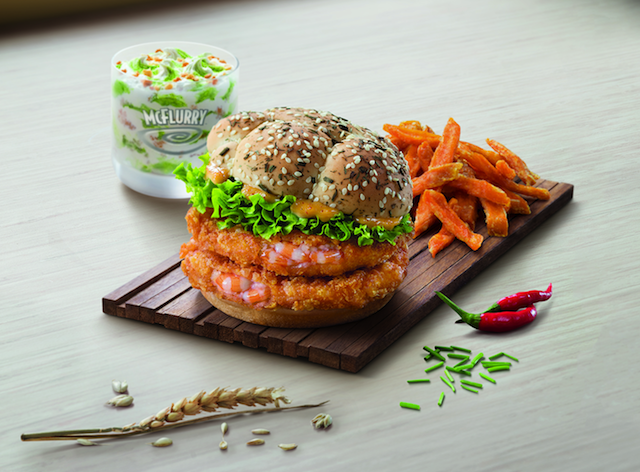 So imagine my surprise when I found out that in 2015, McDonald's is launching a new version of their Ebi Burger, made with cereal in the batter called the Ebi-Kase Burger! What's also amazing is that it came with sweet potato fries, which I believe is also a first. And just to throw in a sweetener -- there's also a Honeydew McFlurry ($2.90) in town. This new menu will be available in stores starting tomorrow, 3 September, in all stores. I had loads of fun at the media preview invite, where the team put in so much effort to "Japanify" the area, including serving the sweet potato fries in a lacquer bowl, on a lacquer tray, on top of a bamboo mat. We were also provided Welcome Drinks -- the Ribena Chill (on offer at $1.95) or Mango Peach Chill. Both were really delicious and refreshing by the way, and not too sweet (most important). During the tasting they even provided props and costumes for us to take photos with! So much effort! Taste-wise for the burger, I definitely liked the thicker batter, though I did not necessarily taste any of the cereal, and the prawns were of course the 'pasty' sort instead of springy, real prawns (duh!). The chives on top of the bun were a nice touch, lending it a bit more fragrance. The main thing that will strike you with the burger though, is the spicy sauce, which assaulted my taste buds. 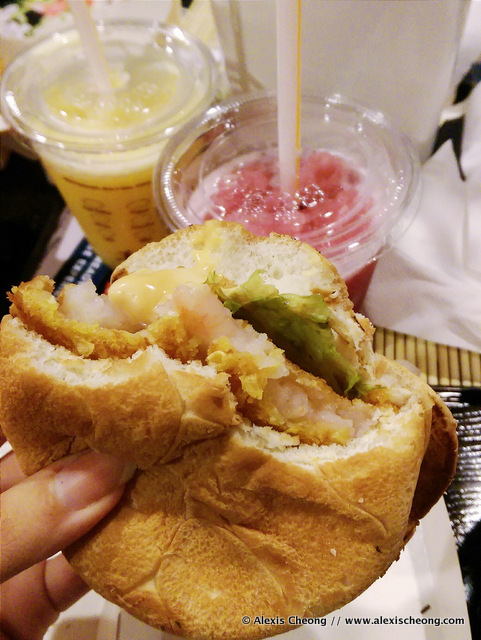 I believe the old Ebi burger did not have a spicy sauce. It gave the burger a good kick. Personally, I felt that the sweet potato fries stole the show from the burger. The fries were crispy and almost like what you'd get in hipster cafes for half the price? If only this is a permanent item on the menu! And because it isn't, I'll urge everyone to give this a try. Even better than curly fries, IMO! The honeydew McFlurry was interesting. I generally dislike artificial fruit flavourings like banana or orange, but for some reason this artificially flavoured honeydew went really well with the ice cream. 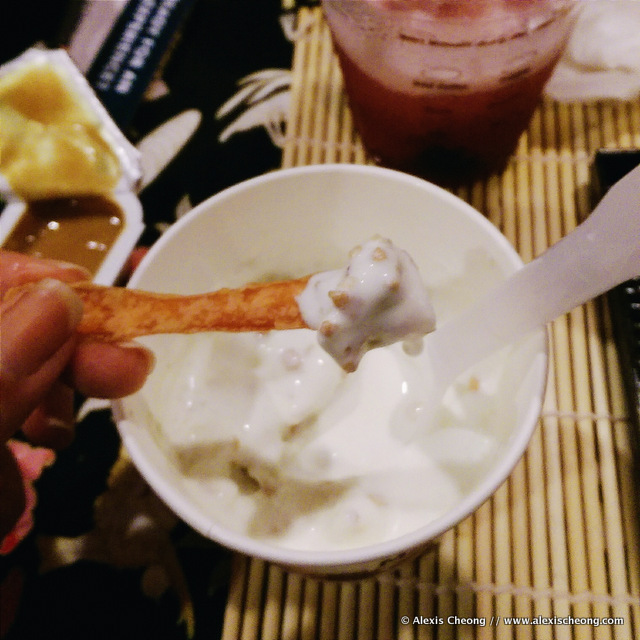 Pro tip -- dip your sweet potato fries in it and get a taste of Japan! 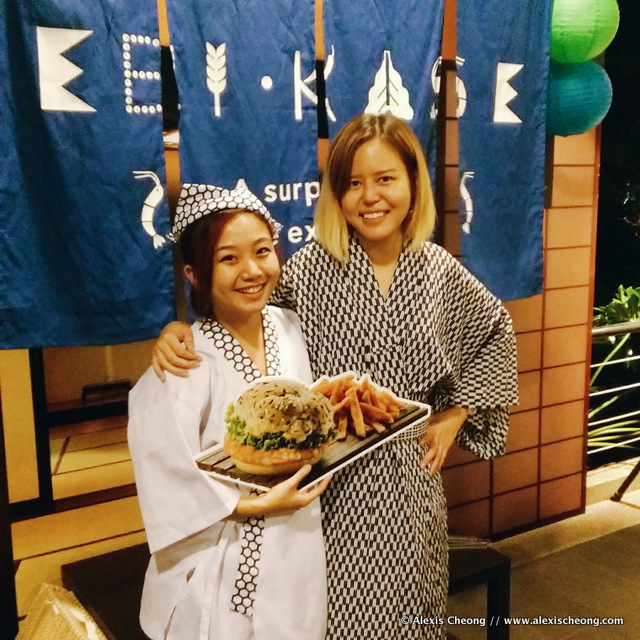 Arigato McdSG and OMY for inviting us to this Ebi-Kase experience! 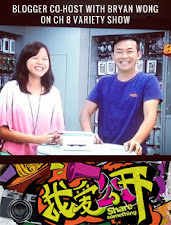 Me and @Stooffi definitely enjoyed ourselves. From 3 September for a limited time only, the Cereal Ebi Special will be available from $7.45 for a Single Cereal Ebi, crispy Sweet Potato Fries (M) and a small Coca-Cola. The Honeydew McFlurry will be available from $2.90. 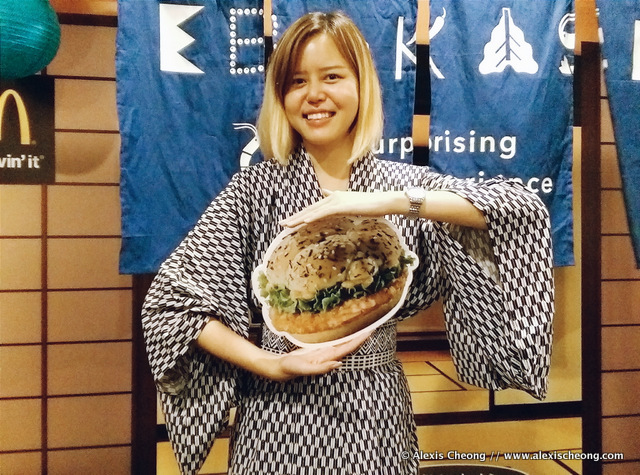 Mcdonald's has launched a second ebi burger, called the Seaweed Ebi Kase burger! Instead of cereal, seaweed (or nori) is sprinkled on the patty, giving it a fragrant smell and taste. 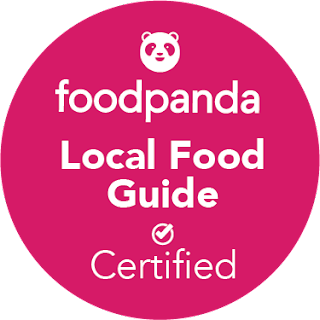 I tried it a couple of days ago and found that I preferred the seaweed version to the cereal one, because it complemented the prawns well, and tasted stronger. It is in stores now for $5.85 on it's own, or you can get it as a meal. Look at the whole prawns nestled inside the patty!